At the February meeting of the Bayside Neighborhood Association, board members and guests got a preview of some significant infrastructure and development projects coming to Bayside. 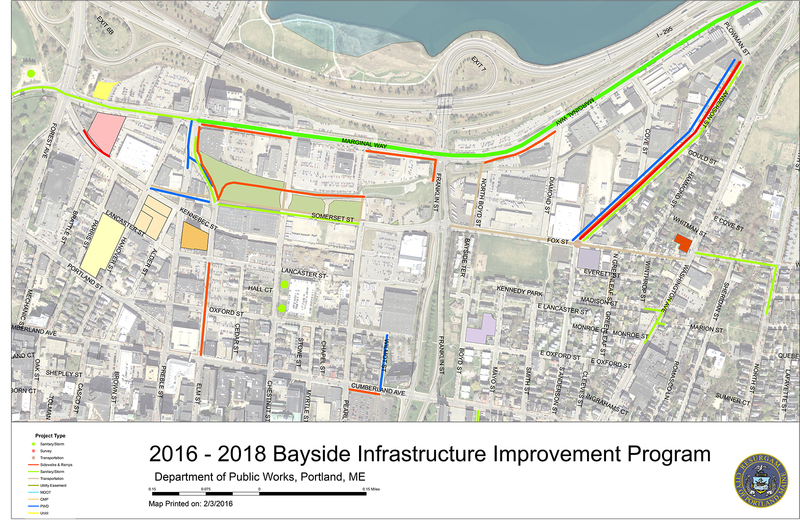 The City of Portland’s Director of Economic Development Greg Mitchell and City Planning Director Tuck O’Brien presented a preliminary map of the Bayside Infrastructure Improvement Program, a collection of planned work that the City aims to manage, and communicate about, as a coordinated effort. The Program includes sidewalk and trail enhancements, waterline improvements, and roadwork throughout Bayside. The two major projects that make a coordinated approach critical are the Midtown residential development and a combined sewer overflow project, two of the largest construction projects in Bayside in recent memory. Midtown, at Somerset Street from Pearl to Elm streets, will have 450 residential units and 800 parking spaces, and construction is set to begin shortly following the sale of the property in February, from the City to The Federated Cos. The combined sewer overflow project, which will utilize or impact all of Marginal Way, is a complex hydraulic engineering project designed to free up existing capacity otherwise used for stormwater runoff and to alleviate the increasing flooding in Bayside. These two massive projects will entail work from multiple utility providers and large construction crews and significant rerouting of traffic. So it only makes sense to plan ahead and incorporate other infrastructure work into a coordinated approach. Other projects included in the Program include improvements that have been in the works for some time as well as newly planned efforts that simply make sense to do when there’s a big hole in the ground already. The overflow project is just one part of Portland’s goal to address sea level rise citywide. Other flooding mitigation projects in the Bayside Program include rain gardens, which utilize plants with a tolerance for the high concentrations of elements typically found in stormwater runoff, such as nitrogen and phosphorous, and that absorb more stormwater than conventional gardens. Funding allocations have been authorized for all projects in the Bayside Infrastructure Improvement Program. However, some projects are still early in the design process, and Mitchell and O’Brien acknowledged that allocations are based on projects “as originally envisioned”; thus budget adjustments are expected as these complex projects move toward realization. The City aims to coordinate both the management of projects and the communication to residents and commuters about plans and impacts. Public meetings will be scheduled about the Program as a whole and about specific projects, as appropriate. The City is planning to introduce innovative ways to keep the public informed throughout the process, including a website with an interactive map to find the latest status on projects impacting a given location. It’s going to get messy for a while in Bayside. When the dust clears, we’ll have more housing, better flood protection, and improvements to our neighborhoods. We’ll post updates on this Program on the BNA Facebook page and in our next issue of The Baysider. Stay tuned!